Your flight from Auckland will arrive in Singapore at around 6.40am. After dropping your bags at your accommodation, and perhaps a quick change of clothes, you'll be ready to start exploring. Our 48-hour itinerary covers some of the best things to do in Singapore, beginning with a nature walk in fresh air and sunshine, to help your body make the switch to local time. Fuel up with a healthy tropical fruit breakfast or tuck into something very Singaporean, like traditional coffee and kaya toast (coconut jam, sugar and eggs on toast). Ask your hotel to recommend a traditional coffee shop nearby. Head to the magnificent Singapore Botanic Gardens to stretch your legs in a peaceful green environment. Just five minutes by taxi from the Orchard Road shops, this UNESCO World Heritage Site covers 200 acres and includes Swan Lake Singapore and the National Orchid Garden. With your inner Zen restored, make your way to the charming low-rise hipster neighbourhood of Tiong Bahru. Check out Tiong Bahru Market and explore the galleries, small shops and cafes in the surrounding streets of this beautifully restored historic housing estate. Jump over to the hustle and bustle of Chinatown for historic temples, market stalls and a huge range of delicious eats for lunch. If the queue's not too long, try Hong Kong Soya Sauce Rice and Noodle for an incredibly cheap Michelin Star dining experience. Head back to your accommodation to check-in, freshen up and maybe grab a 30-minute power nap before continuing your Singapore adventure. Next stop is the Marina Bay Sands SkyPark observation deck, 57 storeys up in the iconic triple-tower Marina Bay Sands hotel. This is the perfect way to take in the wonders of Singapore from above. Stroll around the waterfront to Merlion Park for a selfie in front of the Merlion statue (part fish, part lion) before boarding a traditional 'bumboat' for a relaxing tour of Singapore from the water. Call into the historic Raffles Hotel for an original Singapore Sling cocktail experience (served in their pop-up Long Bar until the end of 2018, while the hotel completes its restoration). If you fancy something casual and authentic for dinner try Makansutra Gluttons Bay, just across the pedestrian bridge from the Merlion. This large outdoor food court is one of the best places to enjoy Singapore's famous chilli crab. Catch the spectacular free laser light and water show called Spectra, which starts at 8pm and 9pm every night, as well as 11pm on Friday and Saturday. It takes place on the Event Plaza across the water from the Merlion. After a good night's sleep, you'll be ready for some serious shopping. Point yourself towards the legendary Orchard Road malls. Later today you can explore the popular Bugis neighbourhood and exotic Little India before heading to the tranquillity of Gardens by the Bay or the excitement of Sentosa Island. 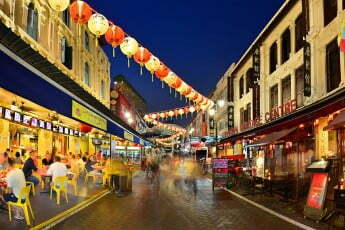 Orchard Road has glamorous high-end malls, exciting international and local labels, and even a few souvenir stalls. You could spend an entire week here! Catch a taxi to Little India to explore ornate temples, the 24-hour Mustafa Centre shops and bustling street stalls. On Searngoon Road and Racecourse Road you'll find a huge selection of flavour-packed Indian restaurants for lunch. Explore the wonders of Singapore's ArtScience Museum. Located at Marina Bay Sands, this lotus-flower-shaped museum combines art, science, culture and technology. 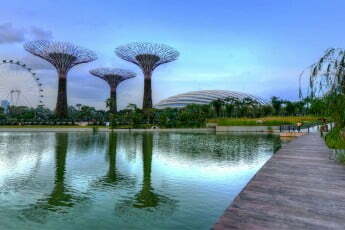 Stroll to Gardens by the Bay, one of the top Singapore attractions. It includes iconic features like Flower Dome Singapore, Cloud Forest Singapore (where you can walk to the top of the world's tallest indoor waterfall), an outdoor sky walkway and the giant vertical gardens of Supertree Grove. If you're travelling with children or teenagers, you could visit Universal Studios on Sentosa Island for themed roller coasters, rides, shows and street entertainment. For your second and final night in the Lion City, celebrate at a top restaurant in Chinatown or somewhere special with a view - just be sure to book ahead. 3Departure day: Your New Zealand adventure awaits! Refreshed and renewed, you're ready to fly to more of the world's exciting destinations. 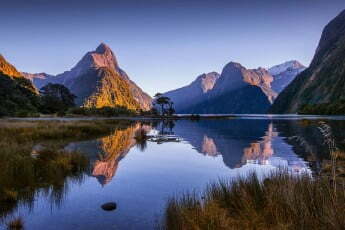 From Singapore, it's easy to reach New Zealand and beyond. Chances are you'll want to experience more of Singapore during a stopover on your journey home.